Our highly‐specialized Air Ambulance service ACCESS (Aeromedical Critical Care Emergency Services Specialists) is a partnership between Air Tindi Ltd. and AMS. This partnership is supported by strong engagement with Aboriginal communities to ensure the social license required for the government contract of this scale and scope. Our ACCESS team includes medical professionals who are supported by the optimal equipment available for the challenging operating conditions of the NWT. Simply put, ACCESS represents the pinnacle of professional Air Ambulance services designed and delivered by Northerners for the benefit of Northerners. In the Northwest Territories, ACCESS partners with the Government of NWT Health and Social Services using aircraft and flight crews provided through Air Tindi based in Yellowknife and Aklak Air based in Inuvik. Between the two bases ACCESS flies over 1300 patient transports each year to 33 communities throughout the NWT. In Western Nunavut, AMS’ Inuit partnership Medic North Nunavut, partners with the Government of Nunavut Health and Social Services using aircraft and flight crews provided through Aqsaqniq Airways based in Cambridge Bay NU. Our partnership flies over 300 patient transports each year to 5 communities throughout the Kitikmeot Region of Nunavut. Our ACCESS team also provides back-up services to communities in Nunavut, the Yukon Territories, and northern regions of British Columbia, Alberta, and Saskatchewan. We transport critical, emergent and urgent patients as well as perform repatriation flights to return patients to their communities. Our air ambulance teams include one or two personnel who are experienced, critical care flight nurses and/or critical care flight paramedics. Mission personnel levels are determined by the nature of the mission based on clinical status, anticipated complications, safety and other factors. Critical and emergent patients may require advanced intervention, including intubation, arterial and central line monitoring, the initiation and titration of inotropic infusions, administration of blood products and monitoring of chest tubes in both the pediatric and adult populations. The most common complaints include obstetrics, cardiac, trauma, gastrointestinal, and respiratory issue. All air ambulance team members are qualified to perform a wide range of treatments and therapies including: rapid sequence induction or sedation; orotracheal intubation; mechanical ventilation; emergency cricothyrotomy; needle decompression and chest tube management; trancutaneous pacing; cardioversion; emergency obstetrics; pediatrics; initiation and transport of blood products and much more. 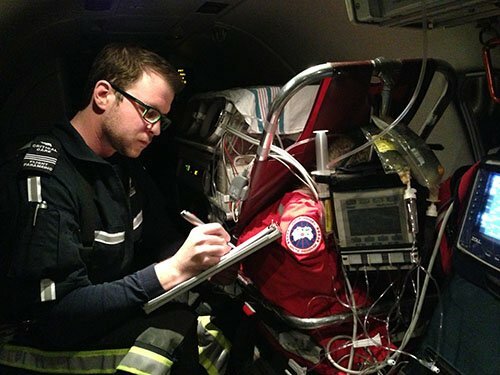 Our enhanced capability combined with our unparalleled level of experience, commitment to superior patient care, dedication to safety and focus on efficiency make our team the ideal choice to deliver professional Air Ambulance services in Northern Canada.